Delicious croquettes of creamy chicken in breadcrumbs. 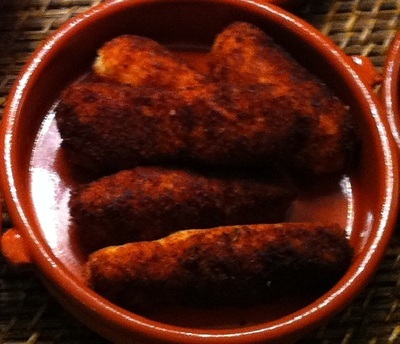 Croquettes de Pollo, so quick and tasty! 1) Fry onions in saute pan for about 5 minutes, until they are translucent. Stir in 1 1/2 cups of flour - stir vigarously. Cook for a further 5 minutes until the flour appears golden. 2) Pour milk into the flour/onion mix, stir continuously for 2 minutes unitl you have a thick bechamel sauce. 3) Add the shredded chicken, salt and nutmeg and cook for a further 2 minutes, keep stirring so the mixture comes together. The mixure should look thick enough that you should be able to roll balls with. Shouldn't be too sticky. If it looks or feels sticky, cook for a little longer. 4) Spread the mixture out onto a baking tray (covered with baking paper) to cool. 5) When the mixture is cool enough to touch, take a spoonful of the mixture and roll into a small cylinder in your hands. Roll in flour, then into the beaten egg mix, and finally into the breadcrumbs. Set aside. 6) When all of the croquettes have been rolled, you are ready to cook them. In a small frying pan heat the olive oil and and fry for about a minute (each) until they are cooked. The breadcrumbs will turn golden. Serve with aioli, and expect them to disspear very quickly.